Talk to Dororan outside Barbarian Village. Head to Barbarian Village and speak to Dororan the dwarf. He, along with other useful people and places in the quest, are indicated below. Dororan will explain that he is in love with a maiden from the Barbarian Village. He will ask you to bring a poem of his to Jeffery the smith in Edgeville. 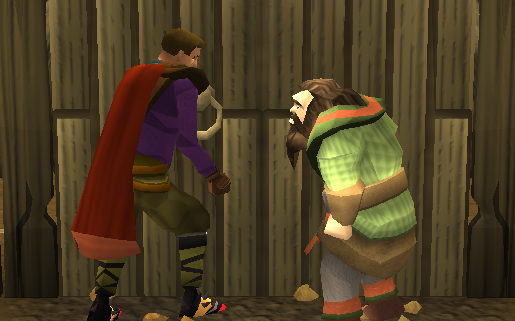 A quick trip North to Edgeville's furnace will bring you to Jeffery. Jeffery will be quite rude, but follow the dialogue below and he will give you the ring you are looking for. 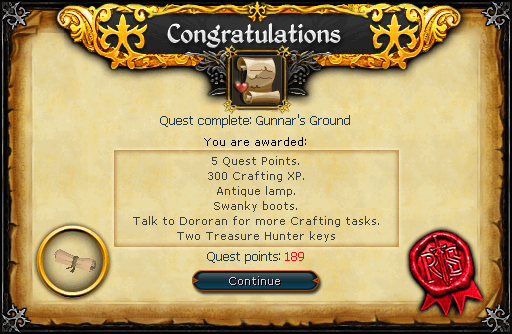 Bring the ring back to Dororan and he will ask you to engrave "Gudrun the Fair, Gudrun the Fiery" on it. This will be done automatically when you use a chisel on the ring. Dororan has an extra chisel if you don't have one. 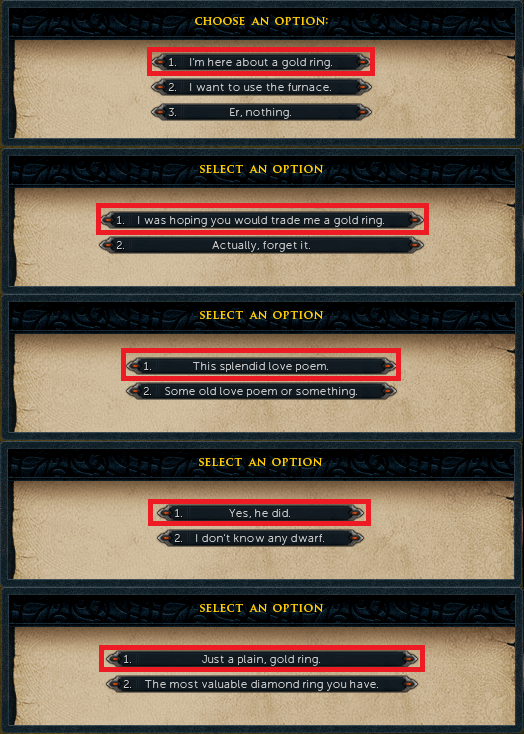 Engraving the ring gives you 125 crafting experience. Dororan will be incredibly grateful and will then ask you to bring Gudrun the ring. Gudrun can be found in the middle of the village near the mining rocks. Tell her the ring is from a great poet and she will say she would be delighted to meet him. There is one problem however. Her father the chieftan would never allow her to be suited by an outsider. She will ask you to sort things out with him. Her father, Gunthor, can be found in the northern longhall of the village. He will be very upset by the idea of his daughter even coming in contact with an outsider and that it is an insult to her ancestors to think of it. He will tell you to leave or he will have his champion, Haakon, dismember you. To avoid combat, select, "I'm going!" Head back to Gudrun and tell her the bad news. She will suggest asking her mystery suitor (Dororan) for suggestions. Dororan will suggest a poem to win over the chieftain's heart. Unfortunately, he will get a bit stuck and need help. He will ask you to give him word suggestions as he writes. Having written this brilliant masterpiece, it needs to be presented to the chieftain. Dororan will suggest Gudrun to recite it. Give the poem to her and she will agree. A cutscene will ensue in which Dororan and your character will listen at the longhall door. Dororan will be very nervous and think his poem is stupid. Reassure him that it is fine throughout the cutscene. The chieftain will love it and announce to the village that the village is Gunnar's Ground, but he is the ruler now. Gudrun will then meet Dororan and give him a hug. Dororan will be given the position of village poet and his own house. 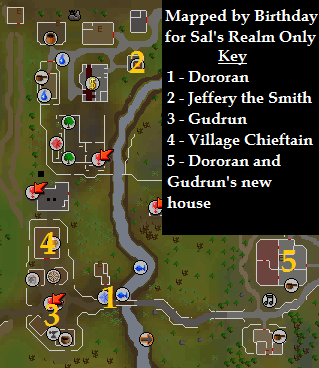 His new house is west of Varrock Bank. 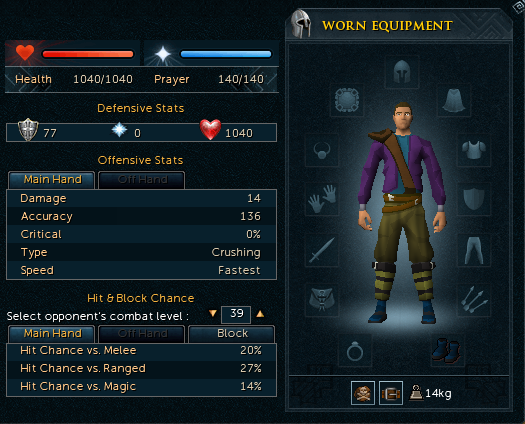 Swanky Boots used to give a +1 magic boost and were the only boots to give a magic bonus in freeplay. However, in the current combat system they give no apparent magic bonus. They are untradable, and if you lose them, you can talk to Dororan for another pair. After the 11th time, however, you will have to trade a Ruby Ring for each time you want a pair. [^] Get ring from Jeffery in Edgeville. [^] Give the ring to Dororan and then engrave it. [^] Give the ring to Gudrun. [^] Speak to Gunthor the Chieftain. [^] Help Dororan with his poem. [^] Give the poem to Gudrun.